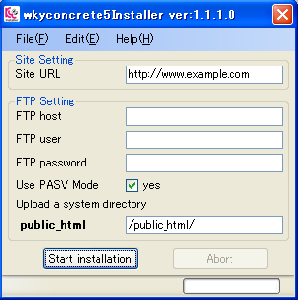 The Japanese to English using Google Translate wkyconcrete5 the automatic installer, open source website management software can be installed easily concrete5. concrete5 site management tool is installed, you can install in one step by using this software. Automation can be easily installed. Please try to download it! *FTP for chmod = attributes (permissions) 755 default directory of our file is 644 (the official request of the security considerations). If the error in the access rights permissions and rental server [wiki:wkyInstaller:ftp_chmod] Please be configured according to your own server to see. XP,. NET Framework2.0 is required. If not get the XP can be downloaded for free from Microsoft. wkyGeeklogInstaller makes your Geeklog installation very easy. If you have experienced troubles at Geeklog installation such as FTP or file permission setting, hope you tyr this. Just one step and complete the installation. Installation for plugins and themses is also available. Before installtion, your server should be equipped with PHP & MySQL database in accordance with 'Installation Requirements' on http://www.geeklog.net/docs/install.html. Please make sure to create a blank MySQL at unicode:UTF-8 in prior to geeklog installation. note:wkyGeeklogInstaller does not work with Microsoft MQL Server and does MySQL alone. 1. Download a file at wkyGeeklogInstaller 2.4.5 =Geeklog automatic install soft= and unzip at your favorite place at your local computer. 5. approximatelly 15 minutes later*, FTP and file permission setting completed and your browser opens at yoursiteurl/admin/install/index.php. note: installation time may longer than 15 minutes depends on performance of your local computer's performance and internet connection. If you are interested in plugins and themes installation, features for advanced users, please leave a comment here. I am going to add more articles here. wkyZenCartInstaller v1.3.0 of the wkyInstaller series was opened to the public. The function to copy Welcomemail under the cooperation of Obitastar rental server externals and to stick is added. As a result, because the value entered the screen by the automatic operation, the installation became possible without inputting the key without worrying because of the input at all. The wkyInstaller series : here please. n body of Geeklog (plug-in and theme, etc.) caused by decompression error. Supporting system to install Zen Cart, the open source software to build online shop. This is the application for Windows. You can install ZenCart into rental server for example. 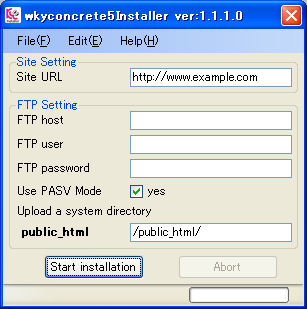 This "wkyZenCartInstaller" saves many steps before installation. What you have to do is to start up the soft ware, fill in the necessary information on the screen and press “Start Install” button that’s all. Detail steps that will be saved are…. This is such a usable and simple software for the installation. You can skip those steps above. You can download the tools from wkyInstaller : Zen Cart placed in download section.